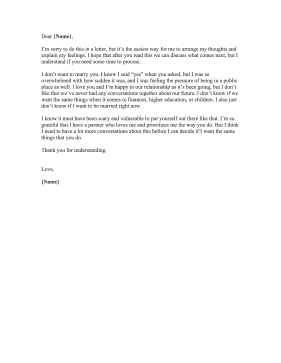 Extricate yourself from an unwanted engagement with this gentle marriage rejection letter. I'm sorry to do this in a letter, but it's the easiest way for me to arrange my thoughts and explain my feelings. I hope that after you read this we can discuss what comes next, but I understand if you need some time to process. I don't want to marry you. I know I said "yes" when you asked, but I was so overwhelmed with how sudden it was, and I was feeling the pressure of being in a public place as well. I love you and I'm happy in our relationship as it's been going, but I don't like that we've never had any conversations together about our future. I don't know if we want the same things when it comes to finances, higher education, or children. I also just don't know if I want to be married right now. I know it must have been scary and vulnerable to put yourself out there like that. I'm so grateful that I have a partner who loves me and prioritizes me the way you do. But I think I need to have a lot more conversations about this before I can decide if I want the same things that you do.